One year ago I blogged about the Metropolitan Opera’s new production of Parsifal, shown live in HD at the UPAC in Kingston (you can read that post here). Last week I attended the Encore HD performance of the Met’s new production of Massanet’s opera Werther, this time at the UPAC’s “sister theater” across the Hudson River, the historic Bardavon Theater in Poughkeepsie. “Encore” performances are the same as the “live” ones except that they’re not live but may be a day or a week later; as with the live ones, in the Encore performances you get the same intermission features, including the interviews with the cast that actually took place during the intermissions. This was my first time ever seeing Werther, which is loosely based on a novel by Goethe, and except for the tenor arias that I have on recordings by the great Nicolai Gedda I was unfamiliar with any of the music. I can’t say I particularly liked the opera — but I did enjoy the performance immensely. Vocally and visually the cast couldn’t have been more perfect. Both onstage and off, tenor Jonas Kaufmann looks the epitome of the handsome, dashing romantic hero, and the title role was as if made for him. Surprising, really, how demanding the role is, and it’s hard to imagine a tenor today who could navigate its challenges more successfully than Kaufmann. French mezzo soprano Sophie Koch in the role of Charlotte gave a virtuoso performance as the young woman torn between being united with her true love, on the one hand, and, on the other, dutifully fulfilling her mother’s deathbed wish that she marry Albert, to whom she is now engaged. Lisette Oropesa was delightfully sweet as Charlotte’s younger sister Sophie, and David Bižić a steady, solid, if somewhat boring Albert (I’m referring to the character, not to Bižić’s performance) who nonetheless exhibited hints of a hard side when he thought himself crossed. Veteran singer Jonathan Summers played the Bailiff, Charlotte’s widowed father. Here’s where the beauty of the close-up camera work of the HD rendition really shines: At one point a telling expression of misgiving flashed across his face when Charlotte’s upcoming marriage to Albert was mentioned. which I doubt could have been visible to the audience in the enormous opera house itself. 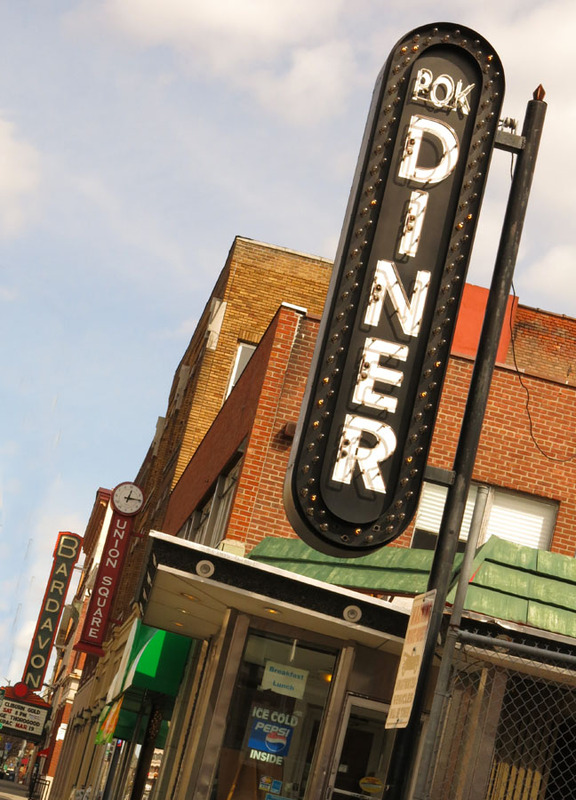 If you want to grab a quick and tasty bite to eat before a matinee at the Bardavon, this historic diner is just down the street. during its heyday, which lasted into the 20th century, renowned artists such as John Philip Sousa, Edwin Booth, and Ignace Paderewski performed here. Converted in 1923 into a venue for vaudeville and silent movies, the theater eventually fell upon hard times and closed in 1975. 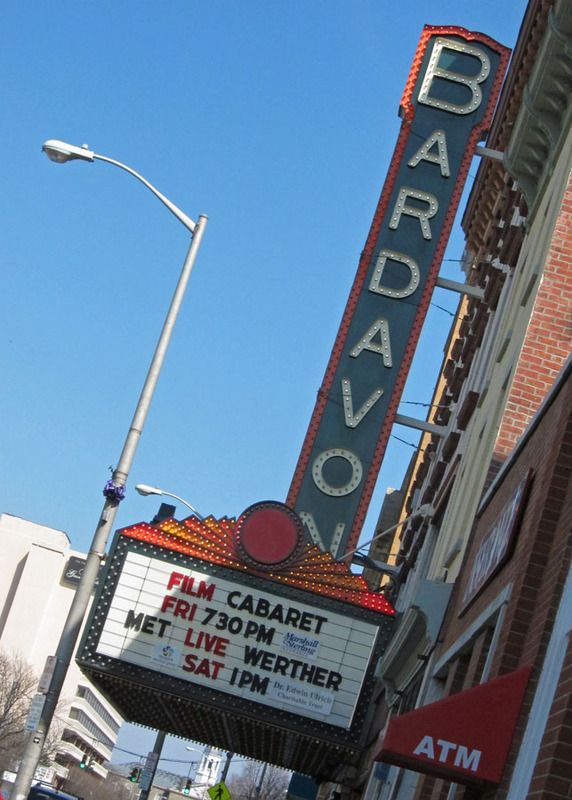 It was actually slated for demolition, but a not-for-profit group was formed that worked for revitalization, the theater was placed on the National Register of Historic Places, and the very next season the theater began its new life as the Bardavon. 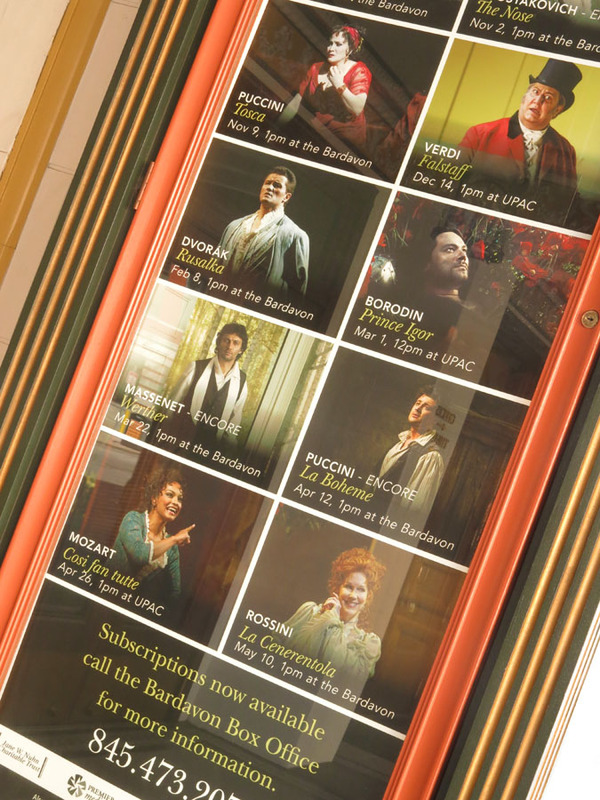 Whatever kind of entertainment you enjoy, the Bardavon and the Kingston UPAC are guaranteed to have something for you. Why not check out their website and see for yourself? View my fine art photographs of Historic New York, including one of Poughkeepsie’s Main Street, here. 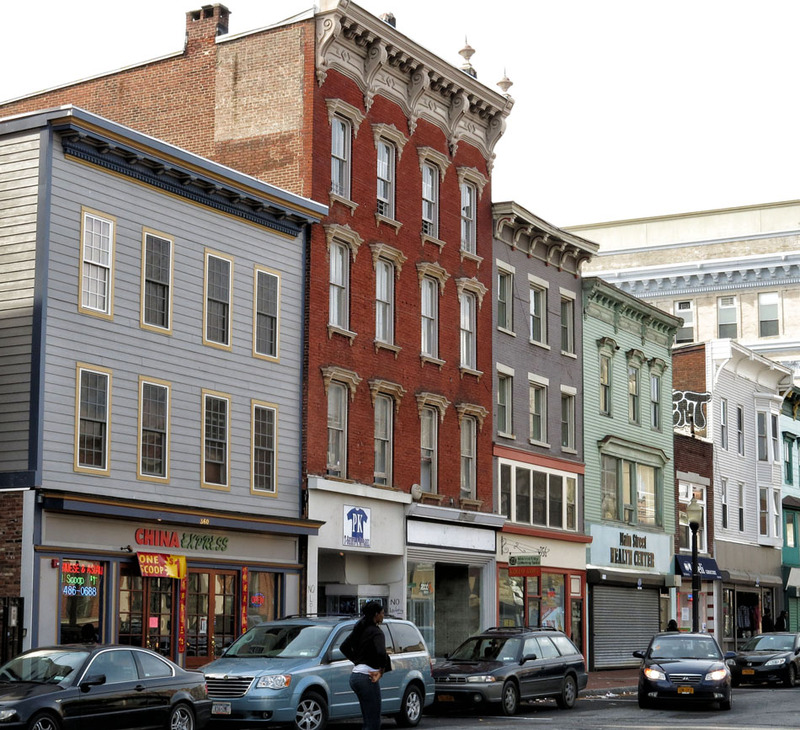 Poughkeepsie’s historic Main Street district. The building on the right houses the Mid Hudson Heritage Center, where I’ll be doing a talk and book signing on Thursday October 24. Poughkeepsie in Dutchess County has been an underexplored territory in my photographic repertoire, and yesterday I set out to put that right, especially since I’ve been invited to give a talk there at the Mid Hudson Heritage Center later this week, in conjunction with a book signing for our Historic Hudson Valley: A Photographic Tour. The “Queen City of the Hudson,” as Poughkeepsie is known, is home to many sites of historical significance, including the Bardavon Theater. It also contains the eastern terminus of the 1.28-mile-long Walkway over the Hudson State Historic Park, the longest elevated pedestrian bridge in the world. The result of a determined community effort to transform an abandoned railroad bridge into something that people can enjoy, the Walkway stands 212 feet above the Hudson River and offers superb views. 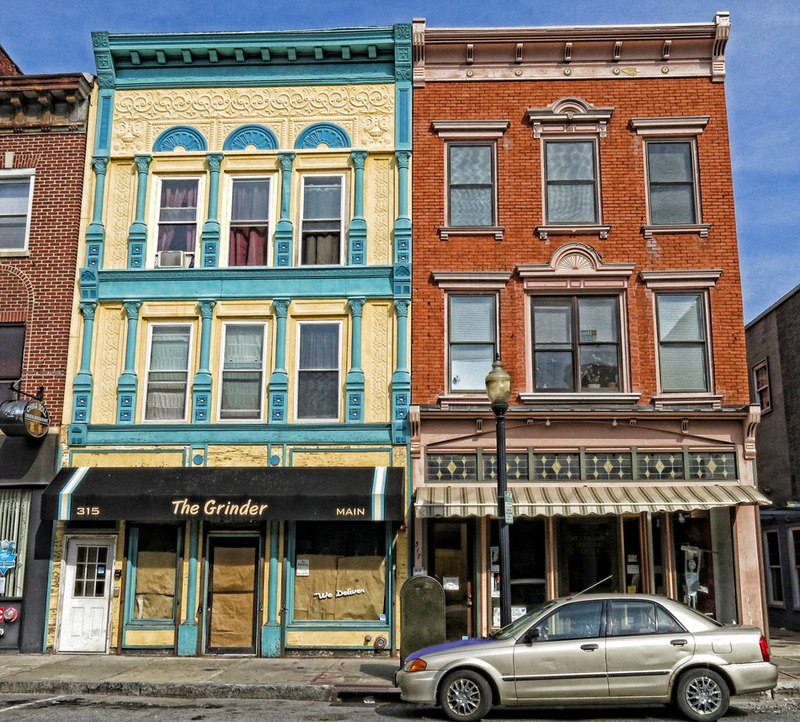 Poughkeepsie boasts a number of historic districts. Here are some photos I’ve taken of the Main Street district. One of the buildings houses the Mid Hudson Heritage Center, one of the city’s leading cultural institutions. My lecture and book signing (I’ll be talking about the Hudson River Artists and showing slides of some of their work and mine) is Thursday October 24 at 7.30 pm. Join us if you can! 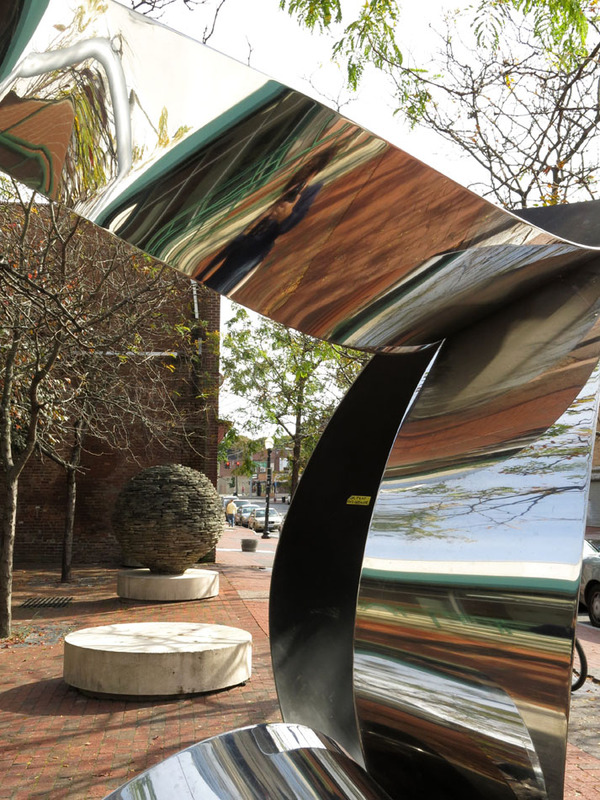 This amazing sculpture stands along Main Street. Can you find me in the picture? Last Saturday I had the amazing experience of enjoying the Metropolitan Opera’s new production of Wagner’s Parsifal live in HD at the UPAC in Kingston. The production was not a traditional one but was set in the present–or, perhaps, a future–time. It certainly had a postapocalyptic feel to it. And it worked. The point: This is a timeless story, not something that could only have taken place in a mythical Middle Ages. The cast was the best that could have been assembled for a Wagner opera in this day and age: it included Jonas Kaufmann (Parsifal), Katarina Dalayman (the sorceress Kundry), Peter Mattei (the wounded Grail Knight Amfortas), and Evgeny Nikitin (the evil magician Klingsor), led by the masterful conducting of Daniele Gatti, but for me the most memorable performance came from the great Wagnerian bass Rene Pape as an unusually youthful, deeply sensitive Gurnemanz. Although I’ve been a professional opera critic in a precvious life, my purpose in this blog post is not to comment in detail on the performance but, rather, to highlight the venue–the UPAC in Kingston. For me, at least, this historic theater was an undiscovered treasure, since until I went looking for a place to see Parsifal I had never heard of it. Thus as a Wagner lover and a historian, it was a double treat to attend the performance here. Originally known as the Broadway Theater (it’s on Broadway in Kingston, a few minutes from I-587), this combination movie palace and vaudeville house first opened its doors in 1927. Twenty years later it was purchased by the Walter Reade Organization and became a first-run movie theater. In 1953 the theater got not only a major facelift but also a new name, the Community Theater. 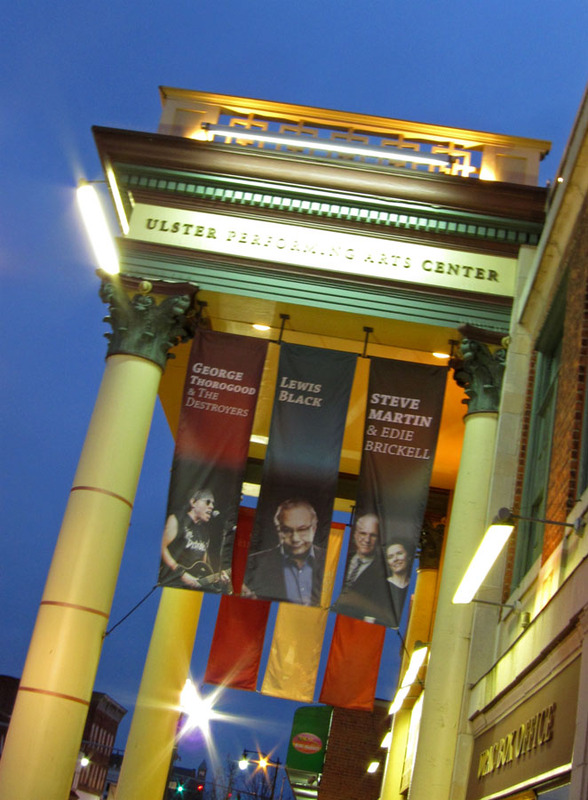 In the 1970s Kingston began suffering from an all-too-common malady as businesses and entertainment venues forsook town centers for suburban mall areas, and by 1977 the theater was slated for demolition–until a group of concerned citizens got together, purchased it, and reopened it as the Ulster Performing Arts Center (UPAC). In 1979 the theater went on the National Register of Historic Places, one of the last great show palaces in New York State. 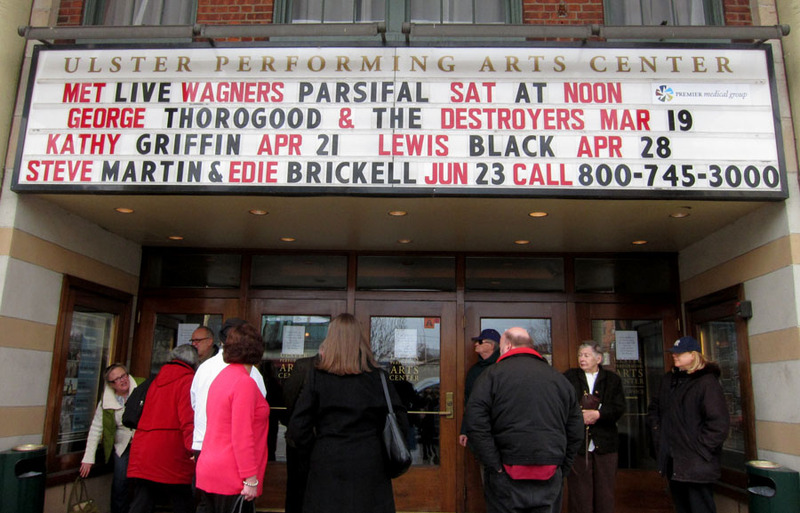 The UPAC is now merged into the corporate structure of the Bardavon, another historic theater across the river in Poughkeepsie, both of them premier performing arts venues in the Hudson Valley. The variety of offerings at the UPAC is quite amazing, as you can see from the photo here. If you visit their website, you can learn about their performance schedule and also become a Friend, which entitles you to various “perks” depending on the level at which you join. The membership covers being a Friend both of the UPAC and the Bardavon, so you get two for the price of one. It just goes to show that people living in the Hudson Valley don’t have to schlepp into New York City for top-notch performances. While operagoers watching HD live aren’t seeing the performances in person, the huge screen ensures that they have a better view than they would at the Met, plus–and this is a major bonus as far as I’m concerned–they get to see the live intermission interviews with the artists, something the Met audience misses out on. Check out the UPAC and the Bardavon today. 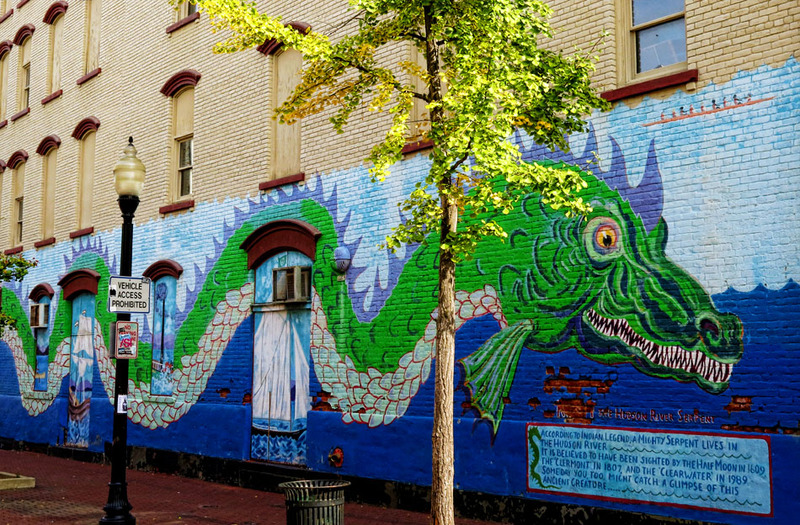 I guarantee you, there’s something at each of them for every taste–and you’ll be supporting a historic artistic presence in the Hudson Valley.